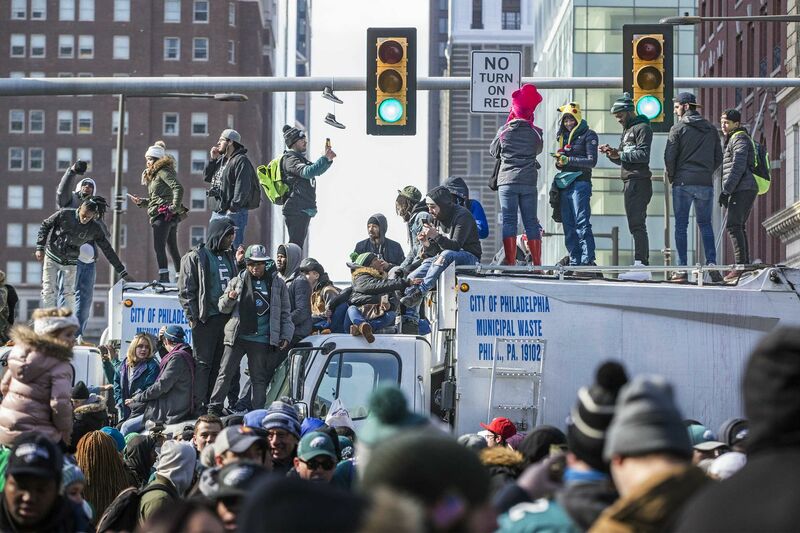 Eagles fans climbed on top of a city garbage truck to get a better view during the Super Bowl parade, which happened a year ago today. Today is not the day for the “Facebook memories” feature. A year ago, hundreds of thousands of Eagles fan rose before the sun to flock along Broad Street and the Benjamin Franklin Parkway to witness something momentous: the Birds’ first-ever Super Bowl parade. It was a time that gave the region Jason Kelce’s now-famous “No One Likes Us” speech that was inspired by a soccer chant, anti-Tom Brady signs, porta potty climbers, a debate on crowd attendance, and even a proposal. The New England Patriots took home their sixth Super Bowl trophy Sunday after defeating the Los Angeles Rams in the lowest-scoring victory in the game’s history. While Patriots fans held their own Super Bowl parade Tuesday in Boston, we imagine it was a total snooze-fest compared to the way Philly partied. Others are already over all the reminiscing. Whether you’re ready for it to be over or just too emotional, there are some steps you can take. To disable Facebook’s memory feature, click on the notifications icon in the top right-hand corner and head to “settings.” Find “On This Day” and choose “none” from the drop-down menu. Facebook, Twitter, and Instagram also allow users to “hide” or “mute” posts by clicking on either the three dots or arrow in the top-right corners of individual posts.